Don’t get caught out on the water! Only the best for your boat with our great selection of Marine Batteries! Marine Batteries – we’ve got your boat covered! 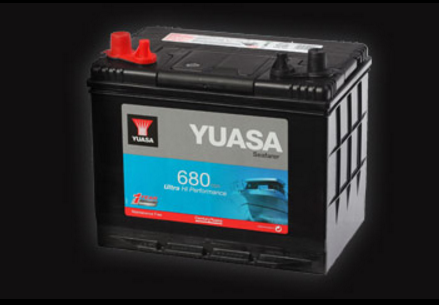 We’ve got your marine engine starting requirements covered with a great stock of Yuasa Seafarer Batteries. Yuasa Seafarer batteries are the best pick within Marine Batteries: built to resist and manufactured to the highest standards in order to handle a rough day out on the sea with rigours of wave pounding and engine vibration as you encounter them in marine applications. Yuasa Marine Batteries stand for performance and quality on the water thanks to its superior power and robust design. Reliable to get your boat started and most importantly get you safe back to shore, the Yuasa Marine Batteries are your lifesaver. Get your Marine Battery check for FREE at our shop, no appointment needed, just pop in at 34 Gumdigger Place in Whangarei. Which Marine Batteries do we have in stock? Thinking about a dual battery system? If you are running more than just your engine with your Marine Battery, we highly suggest to invest in a deep cycle battery as well. Some optional electrics on board may require some heavy power needs which will be better supplied by a dual battery system, which includes your engine starting battery and a deep cycle battery, to get you back safe to shore. Find out more about our Deep Cycle Battery range. If you need help with the replacement or fitment of your new battery, we are happy to take care of this for you. Just give us a call today and book your boat in. We can also perform a free battery check and calculate the correct power need for your dual battery system.